The $14 bn, 4500-MW Diamer Bhasha, now being sold to Pakistan’s public as a “high priority project” has been in the news on & off. The recent spree of donations has once again got Diamer buzzing right before the elections in Pakistan. Well, the timing does ring a bell and must say that deep-state has once again laid its cards on the table (revealing one’s position & intention) in a very astute manner. When Chief Justice of Pakistan Justice Mian Saqib Nisar appealed to the general public, including Pakistanis residing abroad, to donate for the cause, and made personal contribution of Rs 1 million to the newly opened account; Director General ISPR Major General Asif Ghafoor promptly followed and announced that officers of the Pakistan Army, Navy and Air Force will donate two days pay while soldiers will pitch in with a day’s salary for the project. Others to follow were the Water and Power Development Authority (WAPDA), officers of the Khyber Pakhtunkhwa Government, Pakistan Institute of Medical Sciences (PIMS) and so on and so forth. It appears that deep state (lawmakers, ghost-caretakers) have almost aced the art of fooling the taxpayers. 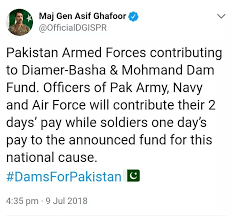 “Donating own salary – for a national cause” almost nails a magnanimous-patriotic gesture by them and the Pakistani populace once again gets tricked that Pakistan Army “leads by example”. Huge contributions then start flowing into a duplicitous account – which to me only smells of corruption. Pakistan’s failure as a state cannot be explained better without citing this particular example. Can a state be run like a charity and infrastructure finance crowd-sourced like this? The calculations here assume an approximate contribution of Rs 20m per day, every day, for years and years on end to meet the mega budget. Can such an endeavor even sustain itself? This is not the first time that a mockery is made of a very critical issue by the caretakers of Pakistan (it is known to all that Pakistan is facing acute water and power scarcity). After the earthquake of 2005, Pervez Musharraf launched a similar fund called the President’s Relief Fund. Once launched, similar pressure tactics were used to get people to pay up, and one by one various companies lined up saying ‘we are pleased to contribute’, and the amounts were a million here, two million there, until interest dried up and everyone moved on. 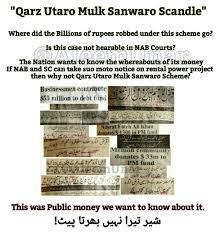 Likewise, Nawaz Sharif launched a ‘qarz utaro, mulk sanwaro’ scheme in his second term, in the late 1990s, in an effort to get donations to help pay off Pakistan’s external debt. This jinxed project (foundation stone was laid in October 2011) has been hounded with several controversies due to an array of complications. It’s geopolitical repercussions (lies in disputed territory), humungous cost, ecological hazards (lies in a seismic zone) and other logistic hurdles have delayed this project over the years. To now seek public donations for its own misadventures-failures (Pakistan has not built any major water reservoir since Tarbela Dam and Mangla Dam were built in the 1960s and sustainability of existing irrigated agriculture of Pakistan is in serious jeopardy) and risking the hard earned money of the people of Pakistan in this project – citing criticality “stating it essential for food& water security”, is purely an act of treason. The common public which is overburdened with the failure of its government sees its Army as a “messiah – only savior”, and blindly follows the diktat. Only a third eye can see how cleverly the “uniformed” have taken over the “ill-informed”. Not immediately, but in the near future, the people of Pakistan will have to absorb this bitter truth which as of now is churning “without any suspicion” into the system. Pakistan’s economy is one of the most water-dependent in the world, still the country is one of the most water-starved. Diamer – seen as the only “fix” to the problem, if ever gets functional will be plagued by Climate/Environmental woes (reason why IMF, ADB refused loans). Therefore “food and water security” bait given to the public is a serious breach of their trust. 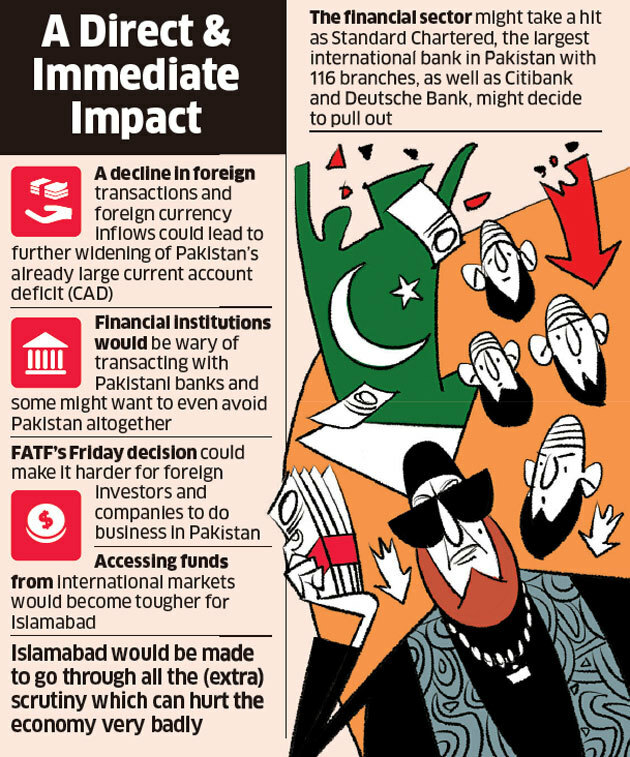 Public donations (including donations from Armed Forces) do happen all over the world in case of a natural calamity, disaster etc ( like Indian Army contributed for flood-affected victims of Jammu and Kashmir in 2016) but crowdfunding for strategic assets can only be heard of in a failed state like Pakistan.